Veiled in a cloak of mystery and ambiguity, the new beer from Minnetonka’s Lucid Brewing, Foto, is a big beer not for the faint of heart. At first glance, it looks and smells like an unassuming, juicy IPA, but that’s where Lucid throws us all a head-fake and starts playing with us. When poured, Foto leaves a finger-thick head that falls quickly into a golden amber body. The aroma is very citrusy over a bright hop overtone, but also very sweet with a touch of caramel. It’s clean, barely allowing a slight touch of pine to poke through. Once tasted, the fun begins. The first impression is a bit of an anomaly; it starts off incredibly bitter, but quickly gives way to a rich sweetness that fades into the malt backbone. From there, it balances and finishes off remarkably clean, leaving an interesting aftertaste of spice and grapefruit tones interacting. The interesting part is the moutheel, as Foto is so thick and syrupy that it almost comes off as a really big IPA, but it clocks in at a moderate 6.5% ABV. Its overall taste is so big and busy that you would swear it’s stronger, but it’s not. Chalk it up to the generous flavoring of cascade, centennial, and zythos hops. Foto is a beer that commands respect, one that borders confrontational. It is an IPA with way more going on than would be expected, and isn’t nearly as strong as the taste would suggest. It looks and smells incredibly sweet and innocent, yet tastes bitter and bold. The best part is that none of these things are at all a bad thing – they just speak to the fun irony embodied by Foto. 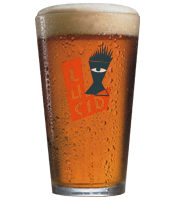 For those attending this year’s Autumn Brew Review, be sure to stop by the Lucid Brewing booth. They’ll have Foto and a few other anniversary beers available for sampling, which will be three kegs of its Belgian Saison; one made with Pinot Noir wine must, one with a Gewurztraminer must, and one with Zinfandel must.